Priority patent application n° 0957772 filed on March,11th 2011 entitled «Procédé de préparation de sesquioxydes cubiques monocristallins et leurs applications." 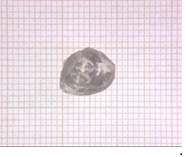 Single crystal or thin layer of doped material made from cubic sesquioxide such as Y2O3, Sc2O3 or Lu2O3 for example are choice materials for optical applications such as laser material. Synthesis of large size single crystals (mm to cm) is hard to achieve due to their high melting point. Generally rods or disks are made in transparent ceramic forms. The present invention relates to a process for the preparation of bulk or thin film single-crystals of cubic sesquioxides (space group No. 206, Ia-3) of scandium, yttrium or rare earth metals doped with lanthanide ions having a valency of +III by a high-temperature flux growth technique and to the various applications of the single-crystals obtained according to this process, in particular in the optical field. 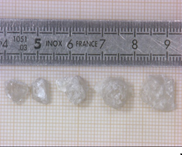 On the left: crystal of Y2O3:Er3+. Crystal growth is made at moderate temperature (between 1000°C and 1250°C) allowing the use of well-known material for insulators and crucible. The process allows to grow this kind of material at half their melting point with the ease of doping with any luminescent rare earth (+III)-ions. As grown crystal a perfectly clear without any oxygen vacancies et do not need post growth annealing. 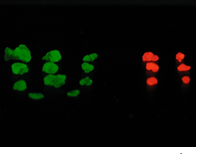 These crystals could be used for usual optical application such as laser materials.